L.A. is in the midst of a fried chicken freakout, marked by the arrival of primo bird crispers Mabel’s and Howlin’ Ray’s. But nowhere is fried chicken being prepared with more imagination than at Osso, a new Arts District restaurant and bar in the former home of One Eyed Gypsy. Here, every day at 5 p.m. the crew at Osso sits down for what’s known in the biz as Family Dinner. It’s a time for the staff to check in with co-owner Ami Lourie, discuss menu changes, and relax with coworkers before the mayhem of service begins. There’s also plenty of food, of course, and at Osso, a lot of culinary experimentation. 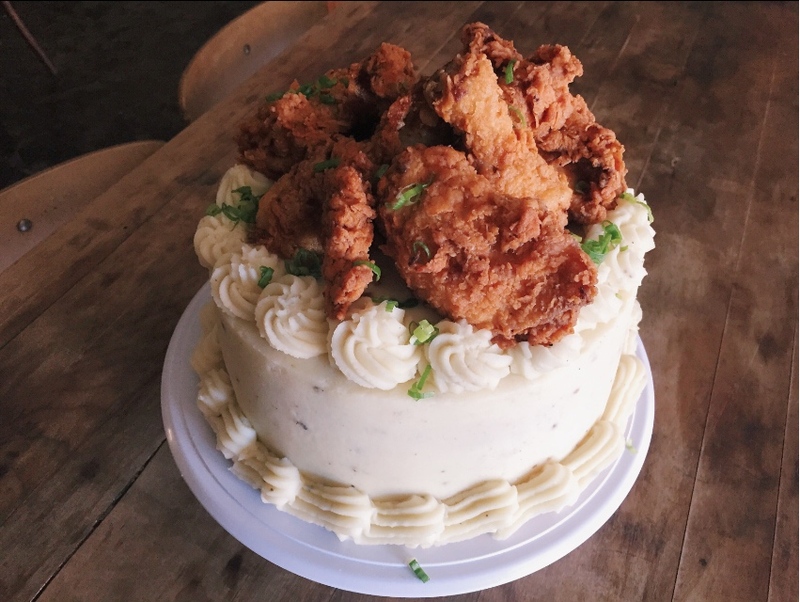 Case in point: the Fried Chicken Cake. Duran’s cake alternates layers of cornbread and super-smooth mashed potato frosting. He also uses the potatoes to create pretty little rosettes and an ornate border decoration at the bottom. The crowning glory is a heaping pile of fried chicken, anchored in place by a dose of country gravy. 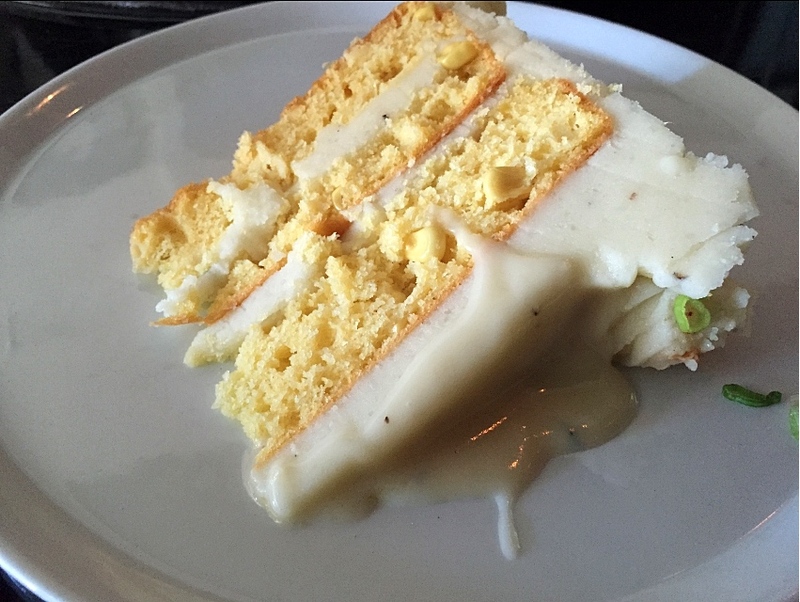 The cake’s layers are made of cornbread and mashed potatoes. Even when not topping a cake, Osso’s version of fried chicken stands out. Brined in buttermilk and dill, the bird is cooked in a cast iron skillet rather than dunked into a deep fryer. The restaurant even tricked out its stoves with extra-high BTU burners in order to quickly get the oil to the right temperature. Apparently that’s the secret to crunchy skin and juicy meat. And it’s also why Osso’s servers warn you that it can take up to 40 minutes to prepare. Sadly, the cake is not on the menu, but the fried chicken can be ordered in half or whole bird portions and comes with potato salad. If you really want to fancy it up, you can opt for a whole fried chicken and a bottle of sparkling wine for $69. At lunch, they put the chicken in a sandwich with honey mustard and pickles. To get closer to the full effect, follow it up with Duran’s honey cake—sure, there’s no gravy involved, but the whiskey buttercream is a nice consolation.